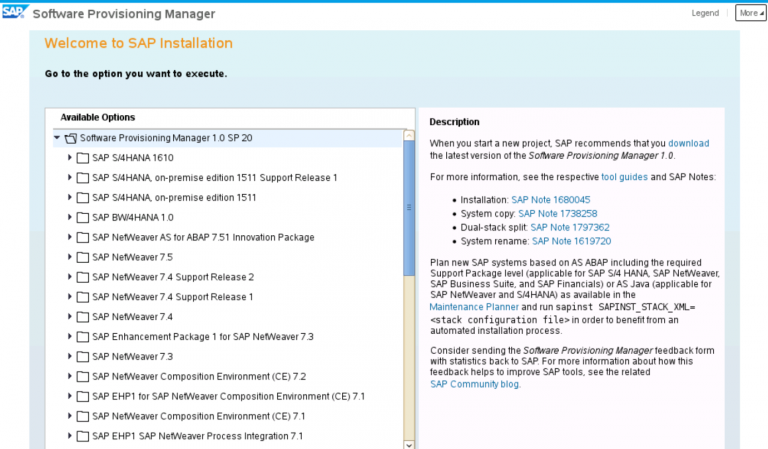 Installing, copy, transform, split, rename, and uninstall products based on SAP NetWeaver AS ABAP and AS Java. It was quite surprising when I started installation for SAP CAR for HANA DB using SP20 SWPM for SAP Netweaver 7.5. SWPM new avatar with surprise –> The most interesting thing on this SP20 is that SWPM is only web accessible via web browser. The interface is running on Fiori platform and now it is identical as the SUM interface. Before you reach the Welcome screen, your browser might warn you that the certificate of the sapinst process on this computer could not be verified. Accept this warning to inform your browser that it can trust this site, even if the certificate could not be verified. My SAPINST does not even complete the initial steps. It just stops. Following are the only messages, after which the command prompt is returned. Any idea? Am i missing something during starup? NOTE: No change to the tunable ‘maxdsiz_64bit’ was needed. Hi Anupom, Please use Q&A section to get the inputs. Are you using root user? with full permission on /tmp dir? Yes I am using root user with full permission to all directories in unix. But the new SL GUI mode never started and I dont see any port number listening for SL GUI. So resorted to the old mode, which worked. This blog helped me launching SWPM1SP20_8 as old GUI. we want to install S4HANA on HANA DB using SWPM SP23 on Linux System. The Hardware is provided in a cloud. We are using putty and XMing to connect to the Server and to execute the commands. First we installed the HANA DB correctly without Problems. ./sapinst SAPINST_STACK_XML=<Path_To_Stack_XML_File> SAPINST_SLP_MODE=false . But after running this command nevertheless i only have the option to run SWPM in browser mode. No Java surface is opening like during HANA DB Installation or running SAP download Manager. Do you have any ideas regarding this behavior? It should open, did u check the logs of sapinst (sapinst*.log) and try to run xclock? xclock works. We solved this Problem with using VNC as Connection to the Server.